Happy Mother’s Day to those who celebrate! I say that because while I have a great mom and am blessed to be a mom, there are those who don’t have great associations with this day. I know many women whose relationship with their mothers is tenuous at best. Many women who have lost their mothers and grieve them especially on this day. And far too many women who are mothers, but whose children are gone. Also because I agree with many that it’s one of those odd Hallmark holidays that puts a lot of pressure on us to celebrate and, in this age of Instagram and Facebook, to compare our celebrations with one another. Who can post the most moving tribute of her mom with the most adorable childhood photos? Who gets the best flowers from her partner or adorable breakfast in bed from her kids? Kelly Diels says, “The Perfect Woman is a form of violence against women” — that we perpetrate against one another. And I think the “perfect mother” is included in that. Because I don’t have it all together. I have good days and bad days like anyone else. I have made choices and prioritized things that maybe other people don’t or haven’t had the opportunity to do but that certainly doesn’t mean I’ve got it all figured out. And some days all I can see is my faults. I even struggle with this blog sometimes, because the images I share, the stories I tell are the highlights reel. You see the days when my plates look pretty as a picture, but you don’t see the days I serve up boxed mac and cheese to my kiddo, or the nights when my husband comes home and I give him a hug and say, “YOU’RE ON YOUR OWN I’M NOT COOKING!” Those happen too; they’re just not Instagram-worthy. And I have to laugh, because if my teenage self could hear those compliments, could see me now, she would fall out of her chair in shock. I was a very late bloomer. There are girls who seem to have it all together in high school; they already embody that ideal woman status by being pretty and popular and put together and on top of it all. I was not one of them. It seems maybe it took me until my 30s to “bloom” if that’s the standard we’re going to go by. Yet I choose to hope there is more to me than this. More to me than nice clothes and a basic understanding of how to apply makeup and do my hair. I hope that I will continue to bloom, that maybe my best is still yet to come. Pretty posies via Bouqs from my mom for mother’s day. 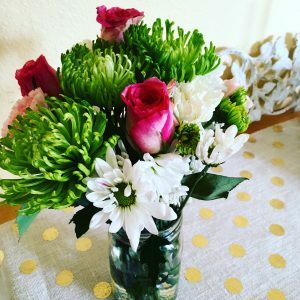 I’m a real fan of their quality flowers and no-frills delivery service (who needs another ugly vase??). D and I also participated in the Wright Cause Walk for the Wright Cause Benevolence Fund. 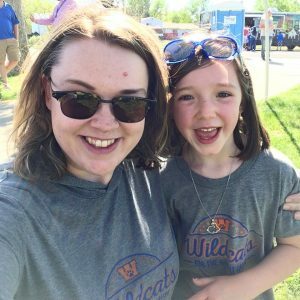 Several years ago, two students and a teacher at D’s school were stricken with leukemia, and two lost their battles. 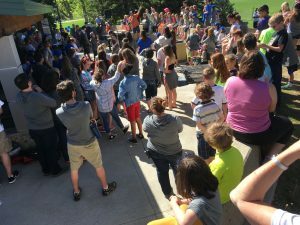 Now, the Wright Cause Benevolence Fund (named in honor of the teacher) provides financial assistance to families, students, and staff affected by cancer at D’s school. It was a little bit emotional for me, seeing the families who had lost loved ones and the bone marrow donor signup table, but I’m very glad we did it. Together. And after, we had truly excellent burgers from the Pile High Burgers food truck that came to support the event — and which I completely neglected to photograph. They were that good! The burgers were smashed and crispy perfection, with very flavorful meat on soft brioche buns with tons of fun toppings. We tried the BLTA — bacon, lettuce, tomato, avocado and mayo with a burger — and the blue cheese burger with tons of blue, grilled onions, and bacon. Great fries and onion rings, too. It’s not often you pay food truck prices and feel like it was a good value, but we did! Highly recommended. 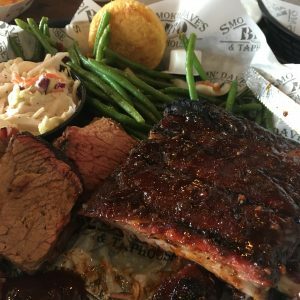 We tried Smokin’ Dave’s BBQ at their new location in Denver. We tried them in Estes Park last fall when we spent a weekend up there at the YMCA of the Rockies, and are glad to have an outpost closer to home. Good brisket and decent ribs. Really good fried pickles — that I totally ordered by accident. The waitress came to take our drink orders and asked if we’d like any pickles, and I assumed she meant like pickles and onions that you sometimes get at BBQ places (at least in Texas you do). Turns out I had ordered fried pickles. No one complained. 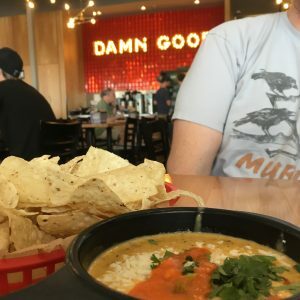 We also had some damn good queso at Torchy’s Tacos at their new-ish location in Westminster. Between this and the fact that we’re getting a Chuy’s in Westminster, I feel like I finally have real Tex-Mex in Colorado! 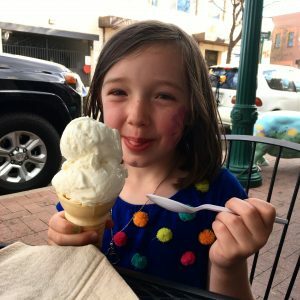 We also hit Scrumptious in Arvada last night — because sometimes you need ice cream for dinner. D enjoyed the honey ice cream in a cone, while I tried chocolate pistachio and amaretto, and B had “darkness” (dark chocolate with brownies) and chocolate cookies and cream. Weird that it’s the only real ice cream joint close to us (frozen yogurt places abound) but we’re not complaining. Parking at the new RTD lot just down the hill makes visiting Old Town Arvada much more pleasant and less frustrating on a Saturday night, too, FYI. 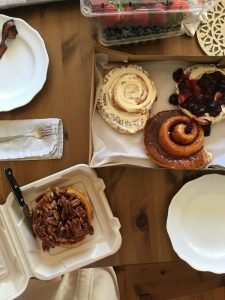 And this Sunday morning, B made the trek out to Northglenn for these incredible cinnamon rolls from Cinna Box. First a food truck, now a physical location and coffee shop, these are some of the best dang cinnamon rolls you’ll ever have. Use the 4.5-inch paring knife in the bottom left of the photo to understand that these are rolls the size of your HEAD. He came home with a pecan sticky bun, cinnamon roll with Italian butter cream, salted caramel sticky roll, and cinnamon roll with Italian butter cream and cherries. We cut them all in quarters and sampled. All delicious! Before the big snow and hail storms, my friend Butter and I both gathered slightly obscene amounts of wild asparagus (not gonna lie: my 1 pound to her 8 was the ratio) and she gave me some of hers so that it would be eaten. 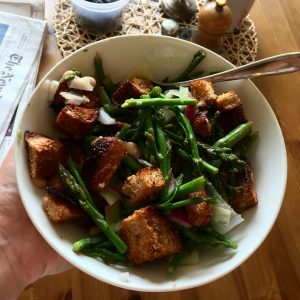 To use up the last of it, I whipped up Smitten Kitchen’s spring panzanella for lunch one day using leftover hamburger buns for the croutons and it was very tasty. I reduced the olive oil to just two tablespoons for the croutons (none for the dressing) and didn’t miss it a bit. I also used frozen leeks from Trader Joe’s that I just happened to have on hand — sooooo much easier than slicing and washing a bunch of fresh leeks! Worth keeping in the freezer if you like leeks. Also, a tip/trick: We walked to the library, and D always likes to play in their play area after we select our books, so I usually grab a couple of magazines and peruse. Keeps us both happy. But what do you do when you come across something awesome in a new magazine that you can’t check out? Rather than digging around for a quarter for the copy machine, I snap a pic with my Evernote app — it has a special setting for documents which makes them easier to read. It gets saved to the cloud and then I can read and make the recipe later from my computer or iPad. Nifty. 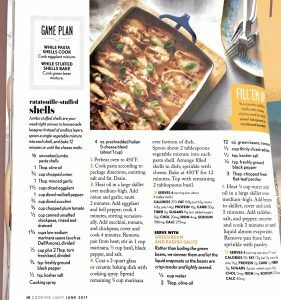 Intrigued by these ratatouille-stuffed shells from the latest issue of Cooking Light. 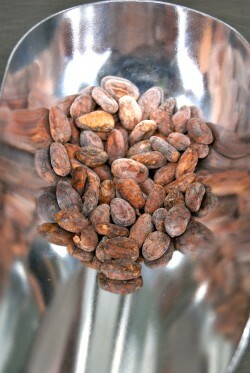 Maybe they’ll make an appearance on next week’s menu.